Palm Islands are three artificial islands, Palm Jumeirah, Deira Island and Palm Jebel Ali, on the coast of Dubai. Creation of the islands started in 2001. As of November 2014, only Palm Jumeirah has been completed. This island takes the form of a palm tree, topped by a crescent. After completion, Palm Jebel Ali will take a similar shape. Like Palm Jumeirah, each island will be host to a large number of residential, leisure and entertainment centers and will add a total of 520 kilometers of non-public beaches to the city of Dubai. 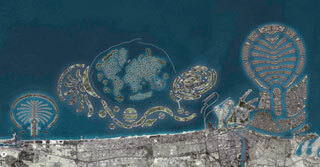 This article uses material from the Wikipedia article "Palm Islands", which is released under the Creative Commons Attribution-Share-Alike 3.0 License.